First, use the leading S pipe distribution valve, take the initiative to counter wear gap, and the sealing function is good. Second, use the wear-resistant alloy glasses plate and the floating ring cut, and has long service life. Third, choose three pump system, hydraulic circuit of each other do not disturb. Fourth, with remote control effect, even more safe and convenient operation. Fifth, concrete transport pump has anti-pump function, which is conducive to timely eliminate plugging failure, and could stop work for a short period of time. Sixth, expected long-stroke cylinder extending the expected life of the cylinder and piston. Seventh, optimized planning of the hopper is easy to clean and suction is very good. Eight, It can take the initiative to have smooth system, ensure the smooth running. Ninth,all the parts transported concrete pumps full selection GB, switching functions well. Camelway Machinery manufacture develops and produces JS concrete mixers which will satisfy your different requirements. 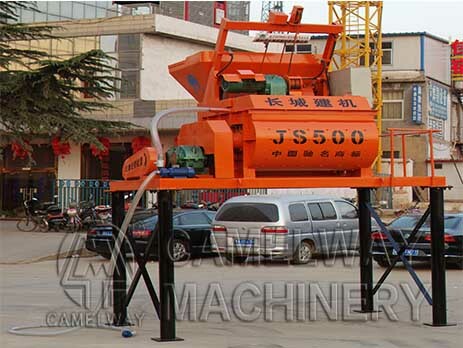 If you want to know more information about the JS concrete mixers or buy it, you can contact us. We will try our best to service for you.